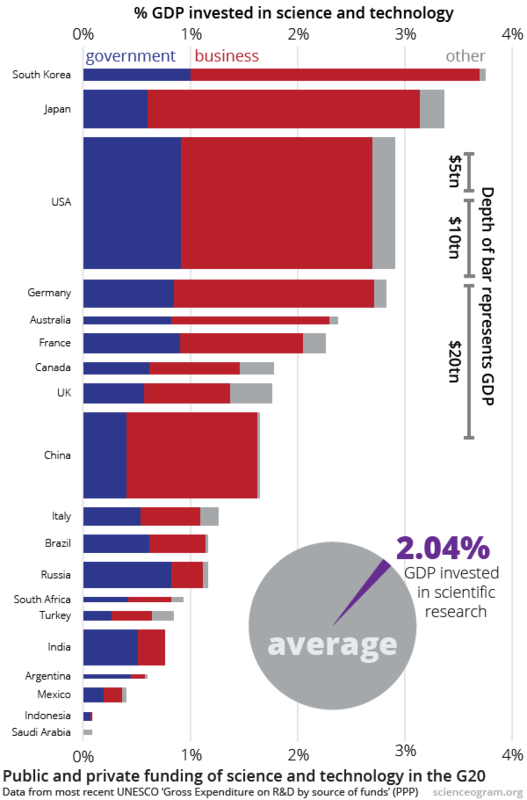 How much do we really spend on research and development, and how does it vary internationally? To provide some context for The Conversation’s science funding debate (Science is vital, just not in the way you think vs Trust the markets to fund science), we broke down spending across the G20 countries. The private sector forms a large part of the research ecosystem: with the exception of Brazil, Russia, India, Argentina and Indonesia—which make up 18.6% of the GDP on display here—the private sector makes the biggest contribution to national research budgets. The United Nations publishes a range of statistics on scientific research and development on the UNESCO online Data Centre. We used the most recent values of ‘GERD by source of funds’ (GERD = Gross Expenditure on Research and Development) for government and business enterprise, and aggregated the other categories (private non-profit, higher education, abroad and “not specified”) to work out where nations sit relative to one another on an internationally uniform scale. Finally, while UNESCO make the separation of the ‘source’ of funds and the ‘sector of performance’ obvious, other data sources report in a more confusing fashion. For example, Government Expenditure on R&D (GovERD) refers to R&D performed by government bodies, and does not specify who picked up the bill. Conversely, ‘GERD financed by Government’ (the statistic we used) refers to R&D paid for by the government, irrespective of where it was performed. This article was originally published on The Conversation, a website which sources independent news and commentary directly from the academic and research community.